Everblue specializes in providing top-notch sustainability training to groups and corporations around the world. When organizations come to Everblue for group training, they enjoy reduced fees, onsite training, and flexible course scheduling. Our corporate training options offer the most efficient and affordable solutions to bring skills and knowledge to larger groups of employees. If you have a group in need of training, we have the right solution for you! 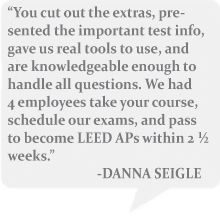 All of our LEED, Solar, RESNET, BPI, and Corporate Sustainability courses are available for corporate and group training. Our instructors will come to your location, on your schedule, and teach exactly what you need. We save you the hassle of having to make transportation arrangements or paying for employee travel. With groups, it often makes more sense to send one instructor to your company rather than arranging for a large group of employees to travel to an off-site location for training. We travel so you don’t have to – avoid time out of the office. Everblue's in-house training is a great way for groups to find focus, to succeed on the respective credentialing exam, and to avoid the time, cost, and inconvenience associated with traveling off site. The best part about the services we offer is that we are flexible! That means we can provide training on any shift, whether it's day, night, or swing. Would expanding a short-term course over several weeks alleviate your employees' workloads? We've got you covered. Let us know how you want the training formatted and scheduled, and we will work with you to make that happen! Our in-house training comes with reduced rates built in. We're also happy to offer corporate discounts and pre-paid vouchers for ongoing training needs. If your employees are spread out geographically, or if your company can't afford to have everyone out of the office at once, we can offer group discounts for students attending our open-enrollment training. Send a handful of students at a time to the monthly classes we schedule in your area. Our goal is to lead industry professionals toward a more sustainable way of life. Let's work together!